And we do. October is gifted with designer couture each year – magnificent vermilion and gold shrugs, mossy green skirts and leggings the color of cocoa. She struts down a runway emblazoned with blue, her admirers looking on in awe. But it’s the beauty of the women of October that stuns me into silence. 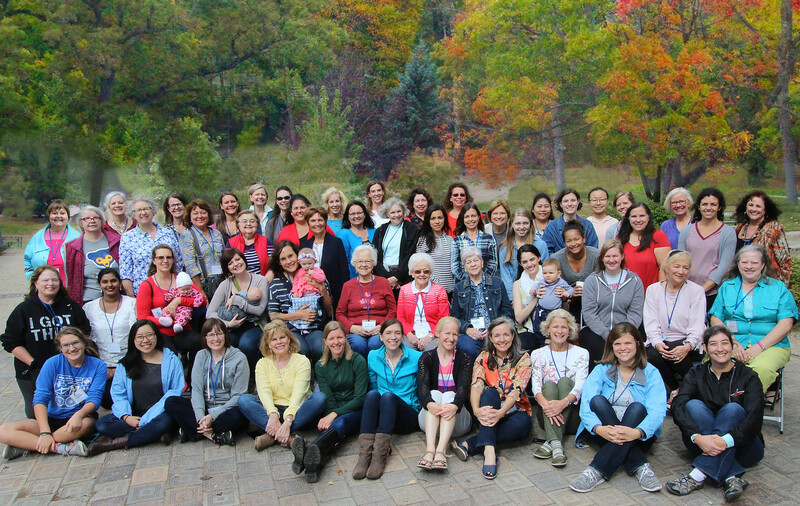 For three or four decades now, October has been the month when I gather with other women who have Jesus-faith, or are seeking it. We call it our fall retreat, but it’s anything but withdrawal. We leave our homes and center ourselves in a place apart not to escape society but rather to find it. The beauty of community, the new green of spiritual growth, the joy of advancing arm-in-arm together. For all of October’s showgirl strutting, I know that dusky November is just waiting to shove her aside. The days suddenly grow shorter, the air chillier. The furnace heaves on with a sigh, the fireplace belches smoke. An ancient loneliness seizes my bones. Who shall we share turkey with this year? So many old friends moved, gone. Darkness has settled over the neighborhood by the time we turn into the driveway after work; no one is visible to call out a greeting or receive it. And it’s at times like that I remember the women of October, the warmth of gathering around a common faith, a burning purpose. Unlike the conscious splendor of the month, its women are unaware of their loveliness. What defines beauty? The shape of a nose or the curve of a chin? Or is it the shape of a soul, the curving line of spiritual discipline. A long obedience, a wise one said, in the same direction following hard after God. In the presence of the women of October, I wish they could see themselves through my eyes. Their beauty has nothing to do with the lines on their face or the lack of them. How short they stretch or tall they stand is purely irrelevant. Skin light or dark, cheekbones high or low, figures full or lean? Inconsequential. But do you know what made me clap my hands in delight again this year? The single factor that stilled and astonished? In a world that values youth, we had it. Teenagers, college girls, young moms cradling their babes, women single and married alike in their 20’s, 30’s, 40’s. And women in the sweet summer of midlife? They were there too, some with their own daughters or neighbors at their side. But best of all, oh so wonderfully rich! were the true women of October. Those glorious with autumn beauty all their own. Women on the shady side of 65 reaching into their 8th, 9th, even 10th decades of life. 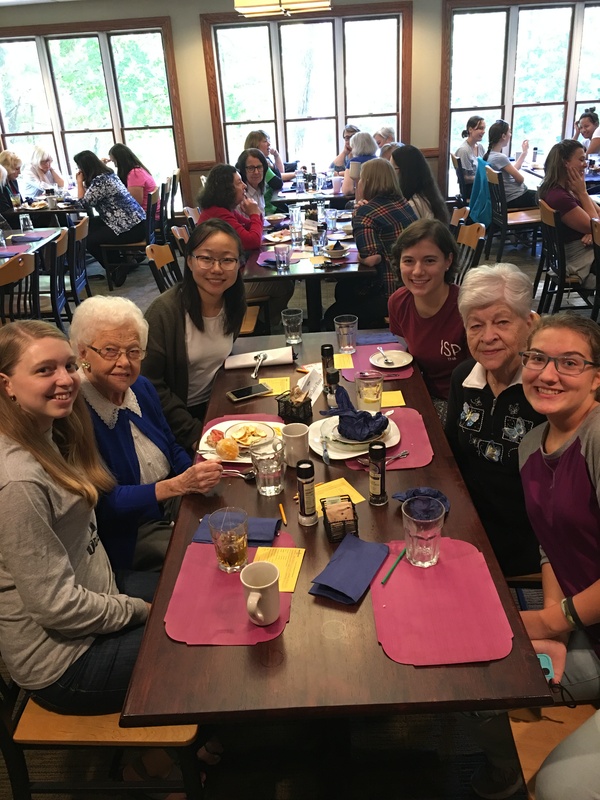 Dear Pearl, a very young 94, lustrous with joy as she attended her very first women’s retreat. We watched with delight as girls of 19 and 90 sat together, sharing meals, laughter and story after story. This is it, don’t you see? The secret of the women of October. In a world where friendships are often defined by season and cliques pull some in while pushing others out, the women of October refuse to separate and segregate. If youth only knew and age only could does not apply here. On retreat, the younger listen attentively, eager to absorb the wisdom of their elders, while offering an arm down to the lake or a ride into town for their senior sisters. Social observers say that Americans are more technologically but less relationally connected than ever before. Loneliness is a close companion to far too many who can’t find someone like them to befriend. Perhaps we look for friends under a microscope of age and affinity, when we need to broaden our search and pull out a telescope instead- widening our gaze to see women distant from us in age but just as eager to draw close in friendship. November is coming and bringing the cold and the dark with her. But the heat of the fire lit by the women of October will warm me still. As always, so beautifully written from your heart. I enjoyed seeing your pictures with some dear women, that were friends of my Mom’s. I treasure the times we could attend FBC luncheons, or salad suppers in the gym together. I miss those days so much. You brought back many precious memories for me. Thank you for reminding me of my sweet heritage. Never stop writing dear sister. Our Lord uses your words to minister powerfully straight through to our souls. Jody, good catch. I realized that after I posted. I’ll go back and edit, thanks. Maggie, what a beautiful comparison and sounds like all ages had a good , friendly get-together–you didn’t retreat. Thanks, Maggie. Great picture of your Mom. What was most striking to me was the absence of bowed heads (act of reverence? ), noses stuck in iphones in that picture. The ladies were actually having real “facetime” looking at and interacting with one another. Now that’s a picture worth a thousand words. Many familiar faces in the photos & many new to me. I really considered attending the FBC Women’s Retreat this year, but I was in Vanuatu with Christina’s family during that time. Three days after I got home, I drove with a new friend to Bethel Church’s Women’s Retreat. What a blessing & so enriching! We also had a good mix among younger & older. I am also feeling isolated from my girls & their families during Thanksgiving & Christmas holidays. Last year, we began having Thanksgiving with Marcus’ other grandparents near Kokomo IN and will again this year. At Christmas time, we will probably have Al’s oldest brother’s recently widowed wife with us. God is good to understand and provide. Pat, thanks for your comment. I am so glad you saw many familiar places and others who are new – so much the way it should and must be in ongoing ministry. And glad to know you were able to attend a women’s retreat in your area! we know the loneliness of having children far away and the need to “make family” where you are. Love to you and Al!